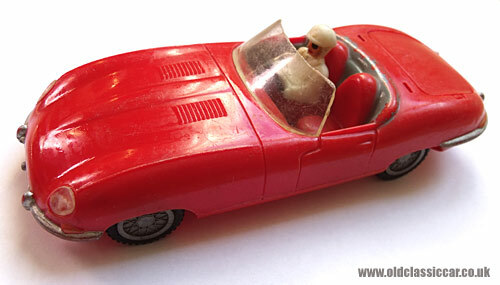 Toy version of the Jaguar E-Type Series 1 by Marx. Jaguar roadsters by Marx Toys. 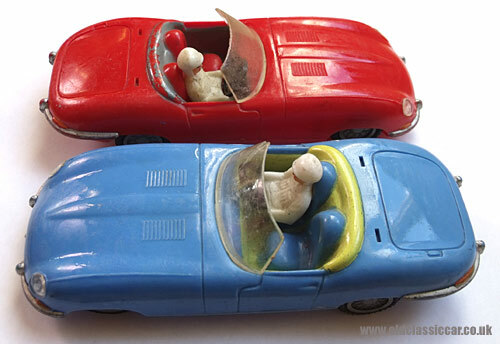 The two plastic toy E-Type Jaguars on this page were produced by Marx Toys of Hong Kong, probably in the late 1960s or early 1970s. 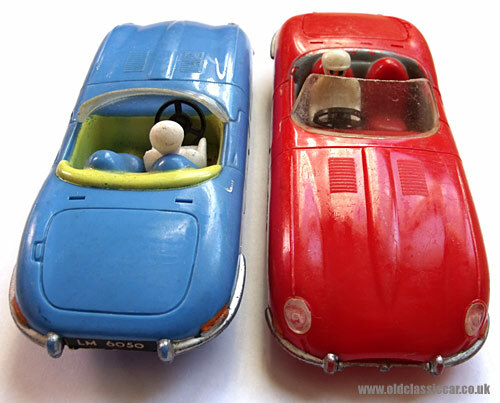 Both the red and the blue car feature a racing driver behind the cars' steering wheels, and both Roadsters are registered LM 6050. They appear to be based on the Series 1 E-Type Roadster, introduced along with the fixed-head version in 1961 and initially destined for export markets only - where it would sometimes be known as the XKE. The toys measure approximately 6.25 inches in length and 2.5 inches in width. Although neither still works, both are fitted with a friction-drive motor that would have emulated - sort of - the car's engine note, although these motors tend to sound more like a tractor with bronchitis, than a straight-six XK on song. Certain parts - the bumpers and indicator lamps - are hand painted, while the rear numberplate is a stick-on paper affair. The headlamps are clear plastic units glued on. While several D-Types feature in the toy cars section already, these are the first E-Types to be included here. Period photographs of early Roadsters can be found on this page, within the photos section of the site.